The Bank of England recently hit the panic button again by announcing another print run of £75 billion (electronically), which is in addition to the £200 billion already printed since March 2009. The news has been accompanied by much economic propaganda across the media sphere from the Bank Governor Mervyn King and Politicians including Osbourne and Cameron to the BBC's journalists / pseudo economists virtually all in unison reading from the same script of printing £75 billion being necessary to boost the UK economy in the face of the imminent threat of Recession / Deflation. “CPI inflation rose to 4.5% in August. The present elevated rate of inflation primarily reflects the increase in the standard rate of VAT in January and the impact of higher energy and import prices. Inflation is likely to rise to above 5% in the next month or so, boosted by already announced increases in utility prices. But measures of domestically generated inflation remain contained and inflation is likely to fall back sharply next year as the influence of the factors temporarily raising inflation diminishes and downward pressure from unemployment and spare capacity persists. Inflation will undershoot the 2% target in 2 years time? Where have we heard that before ? 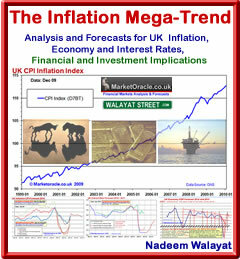 We have had central bank propaganda for the whole of the past 2.5 years of quantitative easing that is more correctly termed as quantitative inflation, that CPI inflation would imminently fall below 2%, which I warned off in March 2009 (05 Mar 2009 - Bank of England Ignites Quantitative Inflation ). Instead of deflation, savers and workers have been setup for a decade of HIGH INFLATION as covered at length in the January 2010 Inflation Mega-trend ebook (FREE DOWNLOAD), because once QE money printing starts then it won't stop whilst large budget deficits exist sending the economy into a state of stagflation which is precisely where the UK economy stands as illustrated by the below inflation graph that has seen UK inflation on both official measures remain not just stubbornly above the 2% CPI target but also above the Bank of England's upper limit of 3%, this despite all of the public announcements of economic austerity, tax hikes, spending cuts and spare capacity that would result in inflation falling as per economic propaganda iterated at length on BBC news bulletins for approaching 2 years now. However, whilst the official inflation rate is at CPI 4.5% and RPI 5.2%, actual inflation as experienced by most people in Britain currently stands at a hideously high 6.8%, which explains why your weekly groceries bill is inflating at a rate twice the official inflation indices that have been manipulated by successive governments to under-report the true rate of inflation. The British population continues to be fooled by economic smoke and mirrors propaganda into bailing out the bankster's at unlimited liability so that no bankster generated bad debts have been defaulted upon, every bond issued by the bankster's that they continue to collect bonuses upon is still being honoured by the tax payers of Britain at huge personal expense that will continue to be born for many years if not decades. The primary mechanism for this stealth theft of wealth is by means of high real inflation induced loss of purchasing power of earnings that has been effectively masked from the public in the UK who are increasingly experiencing the real pain of not being able to maintain their standards of living without triggering angry public demonstrations compared to those that take place in Greece on a near weekly basis in the face of actual pay cuts, as Greece being part of the Euro-zone means it's government is unable to print money and use the inflation smoke and mirrors illusion to steal its populations wealth, but rather it is ultimately for German tax payers to finance the Greece state with loans that will never be repaid even in nominal terms let along real terms. Off course this is out of self interest to preserve and protect their own bankster's that rule Germany with nearly as iron an fist their last dictator. 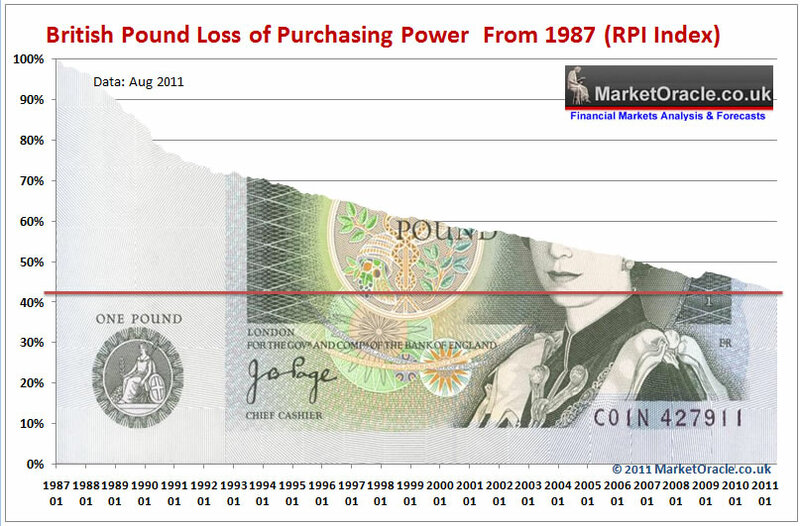 However theft of wealth by means of inflation is nothing new because governments printing to buy votes is a perpetual policy of ALL governments as the below graph illustrates the steady theft of purchasing power of sterling on the RPI inflation measure shows that over the past 24 years near 60% of the purchasing power of sterling has been stolen and funneled to those that control the printing of money, namely the banking elite. Therefore the workers of Britain are in the exact same boat as the workers of Greece, it's just that for the Greeks the theft is obvious as they actually see their pay being cut, whereas in Britain the theft is executed stealthily, slyly by the masters of economic propaganda with chief propagandists such as Mervyn King uttering soothing phrases every now and then of temporarily high inflation that the mainstream press and academic economists (vested interests) lap up and regurgitate at length so as to manage the populations inflation expectations. Savers experience the stealth theft of wealth where even the best savings accounts paying 3% are still resulting in a loss of life time accumulated wealth to tune of at least 3% per year (RPI and after basic income tax). For savers to just break even they would need to be in receipt of a savings rate of at least 6.2%. Savers you have been fooled, fooled into believing that bailing out the banks was to protect your savings. Instead you have lost at least 10% of the value of your savings since September 2008, your savings are effectively being stolen and funneled to the banks to gamble with without risk of loss as they know the tax payer will always step in to bail them out and savers will ultimately pick up the tab. The workers of Britain are now losing out the tune of 5% per annum. the trend is pretty much in line with my analysis of (04 Mar 2011 - Inflation and Tax Rises Crush Britain's Middle Class, Real Earnings 25% Drop!) that warned that peoples should expect to lose between 15% to 25% of the net real terms value of their earnings over the next 2-3years. This is now taking place as a consequence of the three policies of quantitative easing (Inflation), Tax rises (VAT,duty, tax free allowances frozen) and economic austerity (cuts in benefits such as tax credits and child benefit, cuts in public services that now have to be paid for privately). You think your living in a democracy? Think again, because your living in a bankster's paradise that controls your lives in totality, this is as a consequence of the fractional reserve banking system. The words fractional reserve banking may not sound very dangerous, but the fractional reserve banking system is designed to eventually turn everyone and everything (including governments) into DEBT SLAVES, as over time virtually ALL (99%) of the money in an economy turns into DEBT MONEY i.e. it is virtually all borrowed money created by the banks that constantly requires more money to be created / loaned out to service the interest charged on existing debt money and hence the natural outcome is to end up where either Greece is today or an hyperinflationary collapse. All countries are heading towards bankruptcy as a consequence of the fractional reserve banking system which has bankrupted Greece and is going to Bankrupt Britain, it is not a question of IF but WHEN because the system of fractional reserve banking theoretically ensures that eventually ALL of the economic activity of a country would be utilised to service its DEBTs. This is where Greece is now, its debt burden is exploding, it won't be long until theoretically ALL of the Greek governments revenues will be required to service its debt interest, an impossibility which means bailout debt is being piled onto existing debt all the way towards a certain default, therefore there is nothing that the German or French politicians can say or do to prevent this outcome, instead they should be worrying about where their respective countries trend on the path towards bankruptcy because they are all part of the same Euro-zone bankrupting club and it won't be long until the PIIGS have many new members such as Belgium and France as ratings agencies play catchup to downgrade bankrupt countries. Similarly Britain is firmly trending towards bankruptcy, it is defaulting on its debts by means of high inflation as I have iterated numerous times over the past 2 years and most notably in June 2010 (29 Jun 2010 - UK ConLib Government to Use INFLATION Stealth Tax to Erode Value of Public Debt ), at the time the FT's Martin Wolf disagreed with me, now a year on inflation is far higher as opposed to the propaganda of inflation falling to below 2% by now, as illustrated below by the Bank of England Inflation forecast graphs that show that it's economic forecasts amount to nothing more than economic propaganda to massage the inflation expectations of the general population, why does the mainstream press never acknowledge what is staring them in the face? Two years ago (August 2009) the Bank of England continued with its mantra of persistent threat of deflation as UK inflation was to target a rate of below 2% not only by August 2011 but for the whole of the next 2 years as illustrated by the graph. Instead the reality has been that not only has inflation remained above the 2% target, but also above the 3% upper limit for virtually the whole of the past 2 years. The mantra of spare capacity and downward pressure on wages to resolve in disinflation continued in the August 2010 Inflation Report. CPI for August 2011 was forecast to resolve to 1.8%, as opposed to the actual inflation rate of 4.5%. Economic Austerity exists in only words as the UK Coalition government spending continues to grow each and every year which means that the deficit persists as the below debt graph illustrates. So far the coalition government has done nothing that the Labour government would not have done in terms of the debt and deficit which remain on the SAME trajectories i.e. total debt is now expected to target £1.1 trillion by March 2012 which is set against the March 2010 Labour budget projected debt of £1.08 trillion, no difference, which illustrates the illusion of political parties having any real power in terms of being able to act against the debt based economy. Of course total government debt is actually about X5 higher then official public debt at between £4.5 to £5 trillion when one takes in account total liabilities as illustrated by my last analysis and projection of May 2009. Off course public debt and liabilities is not total debt, for on top of this we have private sector debt of banks, corporations and individuals that is usually more than public debt, therefore UK private debt is at least £5 trillion though more probably nearer to £8 trillion, given the fact that the bankrupt banks alone are sitting on approx £4 trillion of debt. Therefore it is no good the people of Britain thinking that Greece is different to Britain, because the only real difference is TIME, we are just as bankrupt as Greece, the same goes for most of the rest of the Euro-zone including the usual PIIGS suspects and then France, with only Germany and the small Nordic countries in a pre-bankruptcy state. I should also point out that America is also bankrupt and so is Japan. My next analysis will look at how to protect your wealth and savings from bankrupting countries (FREE NEWSLETTER). The only answer / solution that the governments have remains as I have iterated countless times during the past few years, that of stealth default by means of high real inflation, and hence the Inflation Mega-trend. Inflation is a REQUIREMENT for the Debt Based Economy, this is how governments keep putting off the day of reckoning by inflating the debt away and then borrowing more money to service the debt interest which is why virtually all money in an economy is debt money that will NEVER be repaid. The formula is simple the greater the Debt (debt to GDP) then the greater will be the Inflation. The text of his speech circulated to Journalists instructed households to pay off their debts. Yes, there is a credit crisis, which means the banks or reluctant to lend, but the governments are PRINTING debt like there is no tomorrow (budget deficits), if necessary they will do what Helicopter Bernanke has done, which will be to drop money from the sky to increase the velocity of money, off course first to the bankster's that own virtually everything (if you have a mortgage then you don't own your home), but eventually as a last resort free money will be handed out to every citizen to spend. There is always another more inflationary option available to governments to ensure that deflation will be avoided, that option is war which the United States and Britain have been quite busy exercising over the past decade which implies these countries should experience higher inflation then the less blood thirsty countries out there, which is evident when comparing the inflation rates on a league table of country blood lust, this also means that we can expect more wars, so it is unlikely that Iraq and Afghanistan are the end but perhaps just the beginning of many more inflation driven wars. You should by now be realising that the over-whelming commentary about the threats and risks of debt deflation are nothing more than propaganda so as to allow policies such as quantitative easing (money printing) to be more palatable to the general populations so as to ensure that the Inflation Mega-trend continues, therefore a good 90% of what you read in the mainstream press which is regurgitated by the blogosfear is wrong. The official CPI inflation indices illustrate the facts of what has actually transpired during the whole period of deflation propaganda mantra of the past 2.5 years. The actual trend for the UK has been of one of continuing accelerating inflation, where the great deflationary recession of 2008-2009 of barely 2 years ago has become only vaguely visible as an inconsequential blip along the path of the Inflation Mega-trend. Do you see that little dip near the end of the above graph ? Well that inconsequential non event which was yet again taken by the mainstream press and Deflationists to run and cry deflation, just as every single minor downward blip during the past 2.5 years has been followed by something similar, if this type of reaction in disregard of the primary trend is not delusional than what is it ? In fact take a second look at the inflation graph and another point should stand out that usually gets lost when one focuses on the year on year changes, i.e. today's UK inflation is 4.5%, last years was 4% etc... What the above graph reminds us of is that the rate of increase in inflation is COMPOUND, which tells you that the rate of decent in the value of money is exponential, i.e. even if inflation stays at 4% per annum, that does not translate in a 40% loss of purchasing power over 10 years but rather 50% because the rate of loss of purchasing power is exponential, just keep that in mind whenever you hear the year on year inflation figures that the Inflation curve is always steepening. Meanwhile, the United States has experienced milder inflation since the Great Recession of 2008-2009. However this is set against the mantra of deflation that implies the complete opposite of what actually has transpired despite the worst recession since the Great Depression. So all of the talk of the U.S. being in deflation for the past 2.5 years has been delusional which does not match the reality of what actually has taken place and given the ongoing multi-trillion dollar deficits looks set to feed a trend for a stagflationary economy for the U.S. for many more years or an Inflationary Depression i.e. not a repeat of the 1930's or the 1970's but something new. Something more akin to low growth and high inflation (above target), which is actually good for stocks because corporate revenues and profits are inflated whilst wage costs are deflated, but bad for the general populations of most western countries who are squeezed to work harder for less real terms pay. The UK personifies the Inflationary Depression with its CPI of 4.5% and GDP of 1.1%. The bottom line is that Quantitative Easing should more correctly be termed as Quantitative Inflation, and Inflation is nothing more than the stealth theft of wealth from workers and savers. The additional £75 billion will be leveraged to over £1 trillion of debt money by the banks by means of the fractional reserve banking system which over time will add to already high inflation, this is what the government wants / needs, for it needs the bankrupt banks to create money to buy the bankrupt governments debt that continues to be printed at the rate of a net £150 billion per year. Now if you disagree with my analysis, then before you start emailing me about why debt deflation must happen, then first read my Inflation Mega-trend Ebook (FREE DOWNLOAD) because the sum of the whole analysis includes climate change, scarcity of resources i.e. peak oil, changing demographics, and the rise of Chindia - ALL contributing to the perpetual Inflation mega-trend. To repeat what I have stated in the past, hyperinflation is a political panic event when the regime is in danger of imminent collapse and the government presses the monetary doomsday button of printing physical notes by the container load to prevent deflation resulting in the loss of confidence in the currency, all countries are trending towards hyperinflation but that does not mean that it is imminent, or predictable, in fact I continue to see no evidence for an hyperinflation event, not today, nor tomorrow, or for the whole of 2012. Still protecting yourself against the Inflation mega-trend ensures your protected against Hyperinflation (even though it still appears highly unlikely in the UK or USA for the for seeable future). My next article / newsletter (within the next few days) will update on what savers and investors should do to protect themselves from quantitative inflation and the bankrupting banks, subscribe to my always free newsletter to get this analysis in your in box. I will endeavour to also include an update on the stock market in my next newsletter, however I usually only do analysis when I need to know something, instead my view on the stock market has remained constant for the duration in that the sell off during the summer into the end of September has presented great opportunities to accumulate target stocks for the long run as consistently dividend increasing stocks are leveraged to the inflation mega-trend. Inflation of 4% over 10 years means that £100 today will be worth 100/(1.04^10) = £67.55 in 10 years. That's a 32.4% loss in purchasing power, not a 50% loss. Also RE:fractional reserve banking, I agree that it's a pyramid scheme if greater than 100% of deposits are then lent out (as with Northern Rock), but I'm not sure whether your point holds when banks behave normally and lend less than 100% of assets. The Loan-To-Deposit (LTD) ratio is a very commonly used measure to evaluate the liquidity of banks. If the ratio is high (e.g. 5:1) it runs the risk of bank raid by depositors. If the ratio is low (e.g. 2:1) it runs the risk of not making sufficient profit to keep the business ongoing. There is no bank that lends less than its deposits, since the interest it pays on the deposits could wipe out any operating margin of the bank. Temporary variations in its deposit level (from current accounts) is managed by overnight parking with the central banks. Yeh, your right, I indexed 4% inflation for 10 years on £100 to £148 without completing the exercise, i.e. I took that to read a 50% loss of value when I should have divided £100 by £148 to equal £67.57. Santander UK is completely ringfenced from Santander Group, it has its own share price and credit rating amd would continue business as usual should Santander Group fail in Europe. Santander UK share price has been relatively stable compared to other UK banks throughout this whole crisis. I dont work for Santander I have just been doing my own risk assesments of the UK banking sector, and deciding how much and how fast to move into gold and other precious metals .. although i think the best way to protect yourself at the moment is to do the same thing JP Morgan is doing .. short whatever your exposed to as an insurance policy and maybe even clean up as the banks fail AND you get 85k compensation courtesy of the UK govmt. If Santander UK is so healthy then why was it downgraded the other week ? Because it was a scattergun downgrade of lots of UK banks based on the assumption that the uk government was less willing to do more bailouts. Im just saying that Santander UK is less risky at the moment than Santander Group .. until we get the property crash in the UK .. then it will be just as risky. Im shorting the whole banking sector, i will do very well if things get so bad that Santander UK fails. Can you name a bank that will definately still be around in 3 years? The inflation spike has often been a good indicator of impending recession, yet your prior analysis (getting old now!) was pretty sure we would maintain growth over the next few years, if anaemic. Would be interested to know your opinion of the market if growth drops significantly below your forecast of 1.2% over the next few years. So far the growth is inline with my forecast, no revisions, I'll leave that to the likes of the bank of England and other other academic institutions.